This list names moany but not all of the wines we offer at Love Wines. Because we are a small batch winery, we can't guarentee our current stock. I strive to source our produce as local as possible, mainly from Oceana, Mason, and Ogemaw counties. While I don't mind traveling around the state to find quality fruit and grapes, I'm proud to be able to harvest lots of local fruits and verietals such as Marquette, cherries, and Muscat grapes from right down the road. As a winemaker, I've prided myself on continuing to strive to use as much local and Michigan grown produce as possible. 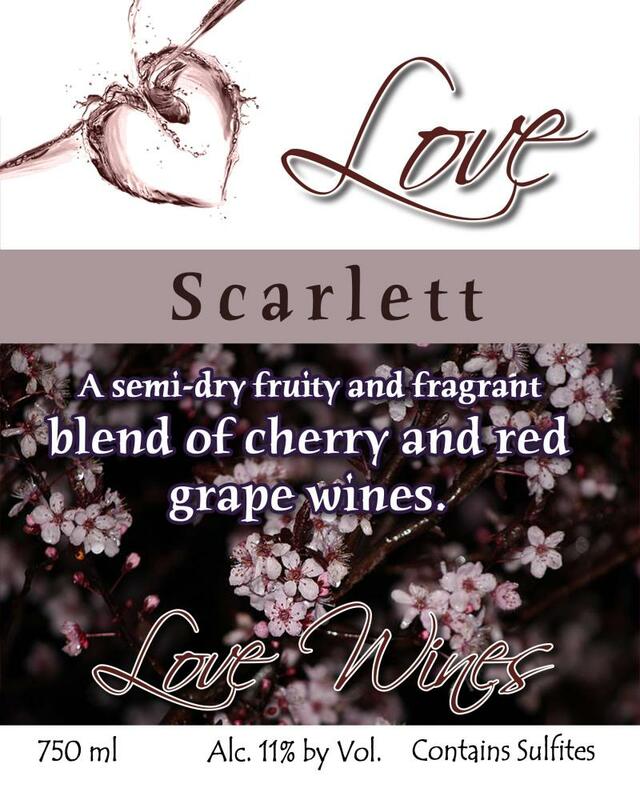 This is a soft and semi-dry blend of Frontenac red grape wine and black cherry fruit wines. The Frontenac gives this blend an earthy aroma and brings some tartness to the black cherry. In 2018 this wine won a gold medal from the Purdue University annual wine competition. It's soft with just the right about of tanins and sweetness to fulfill it's role as an interesting red without being pushy. It's a romantic addition that extends past our dry red lineup. This dry red is a play on the tradition Meritage blend. The Cab Franc and Merlot grapes are sourced from Morgan Vineyards in Coopersville, MI. Anitia and her husband lovingly tend and harvest them for us. This is a take away from a traditional Bordeaux blend using both French and American oak chips in production. This wine is so unique we consider it OUT OF THIS WORLD! Local black berries are blended with black current to create a spicy and semi-sweet fruit wine that is bold and flavorful! This is a dry, non-oaked white wine made from Chardonnay grapes. It can be pared with white meats and makes a great traditional table wine. A special blend of cider from the Klein Family Cider Mill in Sparta is fermented into an off-dry apple cider wine. Local strawberries and peaches are fermented in order to create this fruity lemonade style wine. We've dubbed this wine "Ludington Lemonade" because it perfectly matches the lazy summer atmosphere here on Lake Michigan. This wine goes quickly and is released early June every year. A white, cold hardy grape wine that is crisp and tart. There is a prominent grape and citrus flavor to this acidic wine. Finished semi-dry. A semi-sweet cold hardy grown white grape wine. A Brianna is subtle and fruity with hints of apple and pear. Grape is the prominent fruit flavor. This is a well balanced wine that pairs with chicken or fish dinners. A limited edition summer spactacular! Semi-sweet watermelon wine. Perfect chilled. The house favorite, this is a dry and oaky red made from Cabernet Sauvignon. Its earthy and floral tones give way to a dynamic fruitiness. Firm tanins with a nose of black current. A silky smooth, dry table wine. Mason and Oceana county black cherries combined with just a hint of Merlot to create a wonderfully pleasant deep red. This light and acidic red has citrusy notes along with a drawn out, musky finish. Merlot drinkers tend to favor this semi-dry. Earthy and enchanting. Jammy and pronounced, this bold classic has a strong fruity nose and finishes semi-dry. This is a bold and fruity, semi-sweet tart cherry wine. This is a sweet wine started by fermenting a white Zinfandel. The real strawberry concentrate is added after the fermentation takes place so there is no loss of nose. It is a delightful, fun, and fruity wine that is best served chilled. This sweet dessert wine is expertly crafted to offer a rich and fruity experience. It is smooth, complex and pairs perfectly with a nice chocolate cake or truffel after a meal. This wine is sold in a 500ml bottle rather than the traditional 750ml bottle because it is meant to be sipped and savored. This is a sweet yet balanced Pinot Noir. Again, the raspberry is added after the fermentation has taken place which leaves the uninteruped ripness of the berry to explode in your mouth. Served chilled. A dry, fruity, and floral white with the wonderful flavor of Jasmine tea! A sweet coffee wine with a wonderful Caramel flavor and hines of molasses, vanilla, and oak. A semi-dry blueberry lemonade style wine. Super refreshing and not overly sweet. All of our wines are handcrafted from start to finish and made right here at the wine lab in Ludington. We offer selections from dry to sweet and everything in between. Make sure to like our face book page "Love Wines Winery of Ludington" to stay up to date on all events and happenings. Looking for event hosting? Love Wines offers our tasting room for rent starting at just $50 for the first 3 hours, including a bartender. Here is a sample of what some of our customers have to say... Check out our facebook page to see all of our great reviews! "Great store!! Great customer service!!! Great gifts!!!" "Enjoyed our wine tasting tonight! Thanks for the great personal service! So happy to have this winery added to downtown Ludington!" "I recently purchased a bottle of the Briana and served it at my holiday dinner for my in-laws. Nothing but rave reviews. I will definitely need to pick up a few more bottles the next time I am in town." "The Baco Noir and Chamboucin are amazing!" "Came in with my sister over the holiday weekend. We really enjoyed your wine. I will be back over New Years, I must bring some back to Chicago for my friends." "Made a special trip today to Love Wines! Awesome wines and great hospitality! Thank you Jana Brockwell! We will definitely be back!" Copyright 2014 Love Wines, LLC. All rights reserved.